Fresh and easy to make, this tomato and mozzarella salad is a great way to start your meal or ideal for a quick bite. 1. Place the tomatoes, onion, few basil leaves in a bowl. 2. Drizzle generously with olive oil. 3. Add salt and black pepper. 4. Toss well to coat them evenly. 5. Arrange the arugula leaves on a plate and sprinkle little olive oil and vinegar. 6. Sprinkle some salt and pepper. 7. Spoon over the tomato mixture. 8. 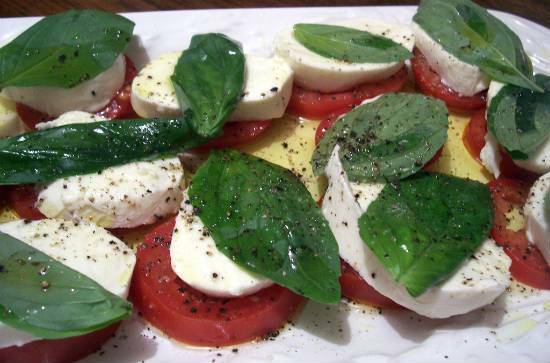 Scatter the mozzarella cheese and basil leaves. 9. Drizzle with more olive oil and vinegar. Feel free to comment or share your thoughts on this Tomato and Mozzarella Salad Recipe from Awesome Cuisine.